Studio Athletica - Downtown Toronto shoulder physiotherapy - Call Now. Below you will find a list of some conditions that we see with our Downtown Toronto shoulder physiotherapy clientele. At Studio Athletica, we specialize in several different services that can help treat your health problems. Please feel free to read more about your symptoms, conditions and our suggested treatments, pricing or contact us to pinpoint the best treatment to heal your body. The downtown Toronto shoulder physiotherapy program is the gold standard. 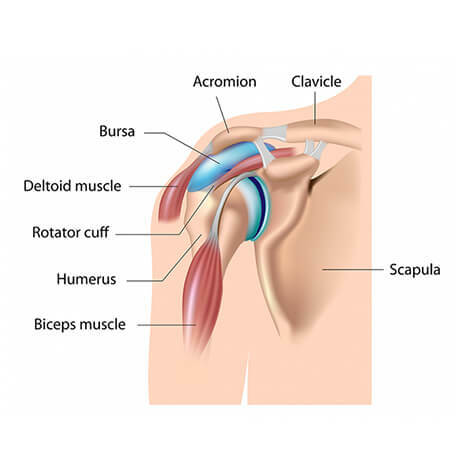 The shoulder joint is kept in place and supported by muscles, tendons, ligaments, and cartilage. The shallow socket of this joint allows for a great range of arm rotation – however, when a dislocation occurs, it means that the head of the upper arm bone pops out of the socket. Our Downtown Toronto shoulder physiotherapy program sees a lot of bicep tears. It is a group of muscles and tendons that surround the shoulder joint. It’s what keeps the head of your upper arm bone firmly within the shallow socket of the shoulder. Rotator cuff injuries can happen in people who repeatedly perform overhead motions in their jobs or while participating in sports or weight training. People may also become more susceptible to rotator injuries with age. Some symptoms include: difficulties sleeping on the side with the injury, an ache that can be felt deep into the shoulder, weakness in the arm, and difficulties reaching behind you, such as brushing your hair or putting on a knapsack. If pain is felt longer than three weeks, you need to see a specialist as treatment options for this type of injury are time sensitive. The most common type of shoulder dislocation happens in the anterior direction which means the shoulder will shift in a forward direction. Direct trauma that results from a fall, recreational activities, or a motor vehicle accident, for example, is likely the cause of dislocations. As well, some people have inherent looseness in their joints which makes it more likely for their joints to be unstable and slip out of place. 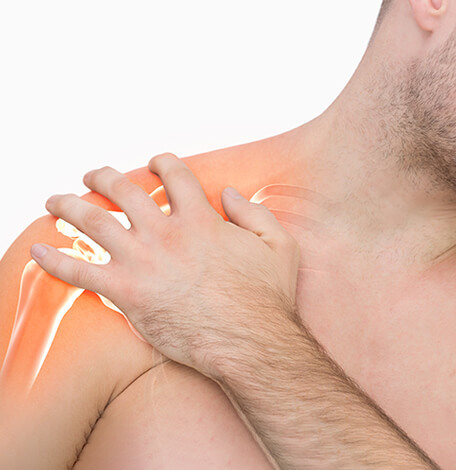 A dislocated shoulder can cause pain in the area as well as weakness in the arm and restricted arm movement. Our downtown Toronto shoulder physiotherapy for AC Joint Sprains & Separations is the gold standard. 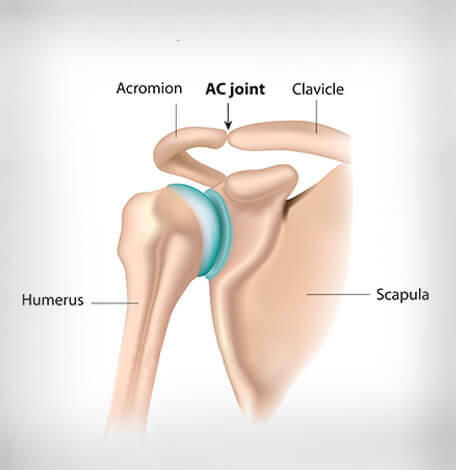 An AC joint separation or AC joint sprain is an injury to the ligament that holds the acromioclavicular joint together at the top of the shoulder. A fall onto an outstretched arm causes this. 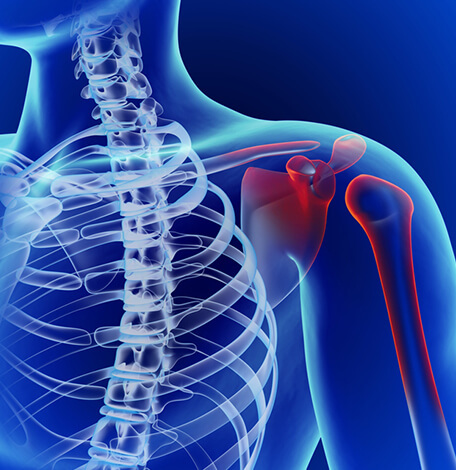 Symptoms of an AC joint sprain or separation can range from mild to more severe and can include pain right at the end of the collar bone on the top of the shoulder. The pain may be felt throughout the shoulder initially, but as the injury progresses it can be felt more localized to point of the bone on the top of the shoulder. Depending on the severity of the injury, swelling may be apparent as well as the inability to reach upwards with your arms. If an AC joint injury is not properly treated it can lead to permanent long-term deformity in the form of a lump on top of the shoulder. Our downtown Toronto shoulder physiotherapy program is for a labral tear in the shoulder. It happens when the cartilage, located in the shoulder socket is torn. This type of injury occurs from a fall, while participating in vigorous sports or workout routines, and can sometimes happen in people as they age naturally. Although labral tears can be difficult to diagnose, the most common symptoms are a sharp pop or catching sensation in the shoulder during certain shoulder movements. 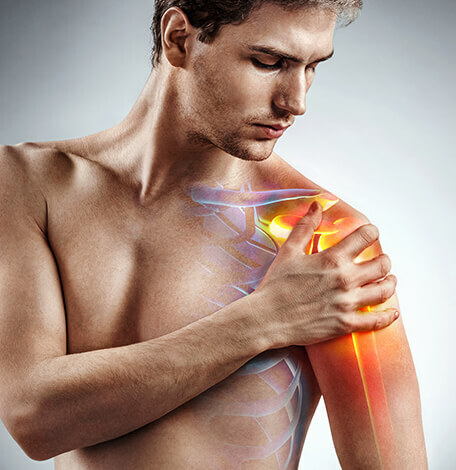 It is also not uncommon for the tear not to cause any pain but rather shoulder instability causing the shoulder to feel loose, as though it slips or dislocates with certain movements. Your pain and past injuries to your shoulder will help the specialist diagnose and treat a labral tear. Just like the name, a downtown Toronto shoulder physiotherapy for frozen shoulder is when you’re unable to move your shoulder due to pain and stiffness in the shoulder joint. 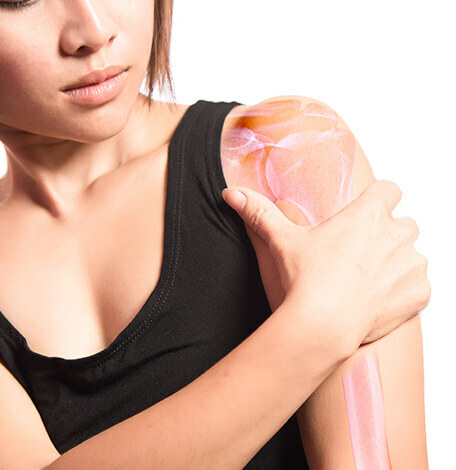 The condition can mostly be identified in people who are recovering from an injury, medical condition, or procedure that prevented them from moving their arm for an extended period of time. You wouldn’t feel the symptoms of a frozen shoulder immediately as it develops gradually and in three stages, each stage can last for a number months. Freezing stage: Simply moving the shoulder causes discomfort and pain while the ability to move your shoulder becomes very limited. Frozen stage: Your shoulder becomes stiffer and harder to move. The pain may start to ease and some numbness may occur, but the ability to move your arm is very restricted. Thawing stage: You are able to move your arm with less discomfort. Getting a good night rest is difficult for most people during the freezing stage. Downtown Toronto shoulder Physiotherapy for biceps tendonitis (inflamed tendon), biceps tenosynovitis (inflamed tendon sheath), ruptured biceps tendon (degeneration or tear), all common terms that describe pain or injury to one of your shoulders’ rotator cuff tendons or bicep tendon. Rotator Cuff tendinopathy is an injury that is rarely seen to occur on its own and is caused by overuse or shoulder joint instability or direct trauma. It usually co-exists with other shoulder injuries such as rotator cuff tears and labral tears. This type of injury is common with contact sports, sports that involve throwing, swimmers, gymnasts, and heavy lifters. Symptoms will include: Pain aggravates by flexing your shoulder or elbow, clicking or snapping with shoulder movements, pain radiating down to the elbow, and muscle weakness. Downtown Toronto Shoulder physiotherapy for bursitis occurs when the bursa sac is under stress, which is filled with fluid and helps lubricate the bones. It is more common in adults over the age of 40 years however, people who are active and participate in high impact sports or weightlifting are more susceptible, including poor posture at work or home and poor stretching or conditioning before exercise. If you have bursitis in the shoulder joint, you will feel pain that is either gradual or sudden, both feeling quite severe. The problem with bursitis is that it could lead to frozen shoulder if the patient is unable to move of rotating the shoulder for longer periods of time while bursitis is being treated. Downtown Toronto Shoulder physiotherapy for Osteoarthritis is the most common form of arthritis. It occurs when the protective cartilage on the ends of your bones wears down over time. It can occur with any joint in your body however, the disorder most commonly affects joints in your hands, knees, hips and spine. Osteoarthritis symptoms can usually be effectively managed, although the underlying process cannot be reversed. Staying active, maintaining a healthy weight and other treatments may slow progression of the disease and help improve pain and joint function. The symptoms include pain in the joints during or after moving, tenderness when applying light pressure to the joint, stiffness, loss of flexibility, grating sensation in the joint, and bone spurs. Downtown Toronto Shoulder physiotherapy for many types of shoulder injuries and fractures are one of them. Fractures are broken bones whereas a fractured shoulder will involve bones such as the collarbone, upper arm bone, and the shoulder blade. It can be caused by a number of things, the most common being suffering a direct blow such as in contact sports or a hard fall. The shoulder blade is not easily fractured because it’s protected by muscles and the chest area therefore, if the shoulder blade is fractured it is normally caused by a high-impact trauma like a high speed car accident where the majority of the injury was taken to the chest. Symptoms of a fracture will include: pain, swelling, bruising, inability to move shoulder, grinding sensation when moving shoulder, or the shoulder will look displaced or deformed. Trauma, injury, and repetitive use are responsible for the majority of arm and shoulder injuries and the most serious at the Downtown Toronto shoulder physiotherapy. Some of these are when the biceps tendon is completely torn. 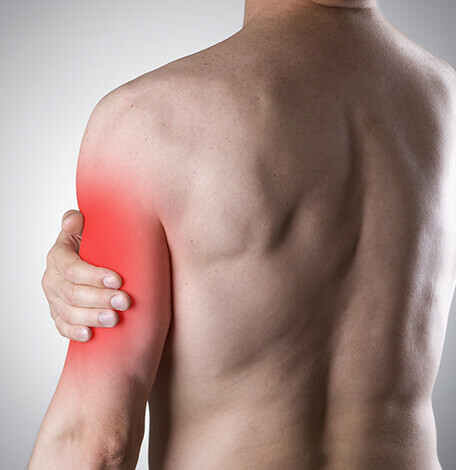 Most commonly, the biceps tendon tears at the shoulder. Biceps/Tricep tears are likely in people who perform repetitive overhead lifting and in athletes who lift weights, participate in aggressive contact sports, or as a result of age due to chronic wear of the biceps tendon. 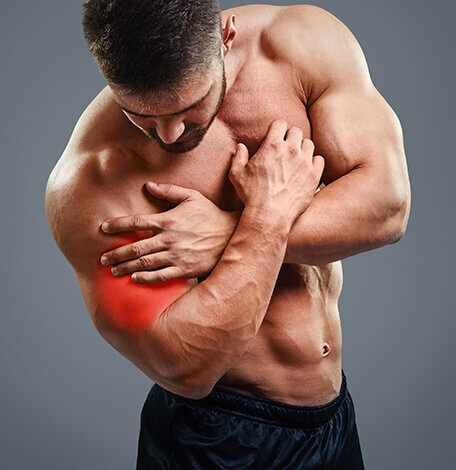 Symptoms of a bicep/tricep tear include: a sharp pain in the upper arm or elbow, bruising, swelling, popping sound when moving shoulder, tenderness, muscle spasms, weakness, and a bulge or deformity in the lower part of the arm.